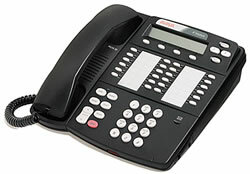 Though the IP Office still supports the 4624, Avaya no longer sells this phone. Customers are encouraged to use the 4610 or 5610 with the IP Office. 4 Display Navigation Keys, right of the display: Menu, Previous, Next & Exit.